Glenn Dye has an interesting perspective on precision farming equipment. Before he began farming full-time two years ago, he sold and serviced precision farming equipment for Greenline Service Corp., a John Deere dealership in Fredericksburg, Va.
Today, he farms 450 acres of no-till corn, soybeans and wheat as well as various cover crops in the Fredericksburg area. He’s a sole proprietor, but exchanges equipment and labor with his father, Paul. Dye continues to update his equipment line for even greater precision in his no-till operation. He started with a John Deere 6700 sprayer that he equipped with an AutoTrac Universal (ATU) 200 steering kit and controlled by a Starfire 3000 receiver and GreenStar (GS) 2 1800 display. The sprayer also has a Raven SmartBoom control that manager his boom in three sections. Dye saves his A/B lines used by his initial pass through a field to control traffic on subsequent passes. “When we make as many as three passes with the sprayer to apply fertilizer and pesticides, the A/B lines are very helpful, especially in wheat,” he says. For planting, Dye works with his dad, using his Deere 4455 to pull his 2009 Kinze 3500 8-row planter with splitter boxes. Dye recently traded in his GS2 2600 for a GS3 2630 that he’ll use to variable-rate lime and chicken litter to his fields in 2013. Dye’s past experience with Deere’s Ag Management Solutions gave him a head start on adopting precision farming equipment in his operation. “I’ve worked with many farmers on this, and the biggest hurdle is just taking the plunge,” he says. 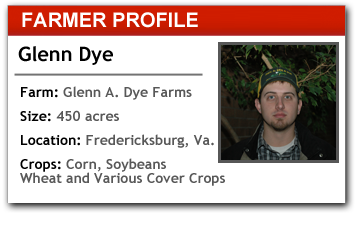 “We had demo kits that farmers could use to get familiar with the systems before they made the decision. Dye also counsels farmers to be wary of used equipment. “Know what you’re getting and understand your upgrade options. If you have a Deere system, you can’t skip generations without starting over,” he says. “This technology is particularly challenging for older farmers, and I still get calls from old customers for suggestions and support.